There were clues when we pulled in the driveway.. A paper laying on the sidewalk, a shinny quarter laying underneath it. I picked up the paper to figure out what the kids had left on the driveway, while we are on our date. The writing told me it was Josh. On the top it said, "Save a Child" there was a picture of a lemon. The bottom said, "Lemonade for $.50" I walked in the house to find all the kids were all lined up on the bed watching a movie. I held up the sign and asked if they did a lemonade stand. (Normally they would have been in trouble for doing one while we were gone.) They said they were doing a lemonade stand to raise money for the adoption. 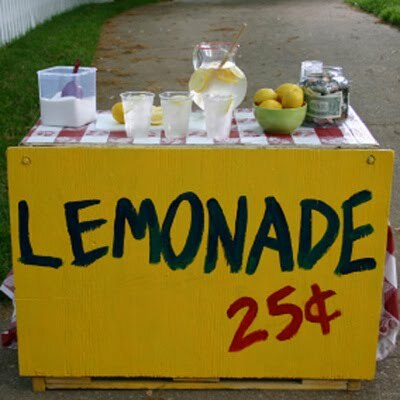 They made the lemonade with some other neighborhood kids and sold it door to door and on the street corner. Telling their customers that we were adopting from Ethiopia, which brought in more than just $.50 per cup :). The adoption jug now has a lot more dollars and quarters in it. It makes it so much easier to know that our kids are excited about their new sibling/s. There are a million reasons people choose to adopt. One of our reasons is that we hope it builds character in our children. We want them to see the joy in helping others and beauty of a multicultural family. I hope and pray the excitement continues for a long time. I hope we teach them that all children are precious to God. I am excited that we get to ride along in this journey together.